Stir pepper sauce and garlic salt until blended. Pour over chicken in large bowl; set aside. In medium bowl, stir together Bisquick mix, onion salt and pepper . Remove chicken from sauce; drain. Coat chicken with Bisquick mixture. Discard any remaining Bisquick mixture. In 12-inch skillet, heat oil over medium-high heat until hot. Reduce heat to medium. Cook chicken in oil uncovered about 15 minutes. 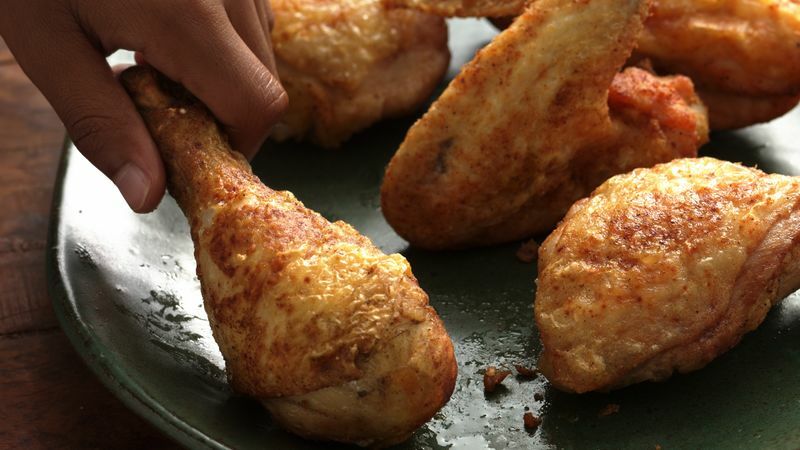 Turn chicken; cook uncovered about 15 minutes longer or until golden brown on all sides and juice of chicken is clear when thickest pieces are cut to bone (165°F). Leftover fried chicken makes fantastic sandwiches. Spread a little mayo on thick slices of bread, and top with chicken, lettuce and sliced tomatoes.